We are today's top on the Drive Back The Darkness Blog Tour hosted by Shades of Rose YA Marketing. 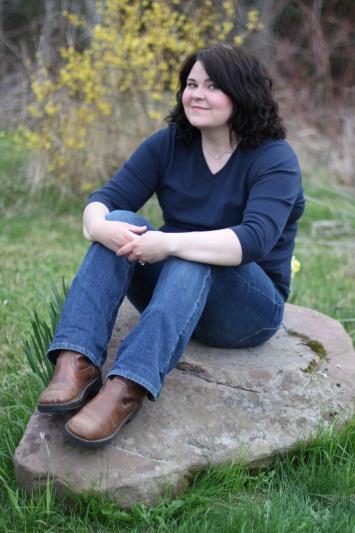 This YA fantasy was written by Amy M. Newman and our interview with the author is below. We welcome you. A kingdom shrouded in darkness. One girl who can save it all. On her sixteenth birthday, Ellie Lyons discovers her entire life has been a lie. She’s kidnapped from her home and left in Alladon, a kingdom controlled by an evil man named Morfan, a kingdom that she was born to rule. Ellie reluctantly faces the impossible tasks confronting her; like learning to control the magic that now roars through her and burns everything she touches, training to become a lethal warrior, or dealing with the fact that Devin, the guy she is irresistibly attracted to, is actually one of the assassins sent by Morfan to kill her. Devin has a troubled past; he has spent the last five years tracking the person who murdered his family. He is dark, dangerous, and deadly serious, but Ellie can see the core of kindness shining deep within him, as well as the fear of getting hurt again that makes him push people away. Though Ellie knows her life might be at stake, she can’t seem to stay away from him, even as her feelings become strong enough that they begin to scare her. Vance, the second assassin and Devin’s best friend, is the opposite of Devin; blonde, charming, seductive. But his heart holds a kernel of darkness, one that makes him dangerously unstable, especially after he realizes that he has feelings for Ellie, feelings he knows Ellie doesn’t share. Ellie can’t let her emotions for the two men cloud her focus, her quest to remove Morfan from power. When Ellie discovers that the children of Alladon have been imprisoned in a secret factory, Ellie knows she can’t fight her destiny any longer. She must claim her rightful place as princess and fight Morfan, or surrender and be slaughtered. Will she be able to survive long enough to save her people from the Darkness? Is Drive Back the Darkness your first novel? Can you share with us your journey to publication? It actually isn’t my first novel. I started writing 12 years ago and started and stopped three or four novels. I finally finished my first one five years ago. Since then, I’ve written four complete novels. Drive Back the Darkness is the third of those four novels. 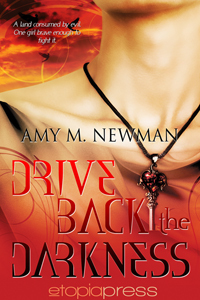 I really wrote Drive Back the Darkness because I loved it. I love high fantasy and I loved my story. I knew going into it that it would be a hard sell, because high fantasy isn’t “in” in the YA market. Even so, I went the traditional route to start; querying agents. I had several requests for Drive Back the Darkness, but they all said the same thing, “We can’t sell high fantasy in the YA market.” I then decided to query publishers myself. Every single one I queried requested it. In the end I decided to go with Etopia Press, a small press with an award-winning cover art department. My fourth novel, a dark, contemporary YA landed me my agent, Michele Rubin of Writers House. We’re currently working on revisions and hope to be submitting to publishers soon! What is the kingdom of Alladon like and how did you go about your worldbuilding? Alladon is a semi-medieval, magical place that is being overrun by evil. It has become filled with dark and dangerous predators (human, animal, and supernatural). I actually love world building, and did a very in-depth analysis of Alladon. I started by drawing maps, because I knew that Ellie would be journeying across the kingdom and didn’t want to get mixed up about where the mountains, forests, and villages were. As far as some of the dark creatures in my story, well, a lot of them came from my nightmares. I’ll talk a little bit more about that in the next question! A princess who steps up to fight for what is right. How did Ellie's story come about? Every one of my story ideas starts with what I call a spark; a character, a small bit of plot or dialogue, a situation, something that intrigues me. In this case I had a dream about a girl who was taken from her home and forced to fight for something she wasn’t entirely sure she believed in. The dream was actually a nightmare. I’ve had horrible, vivid nightmares since I was very small. At least now I’m able to do something with all that scariness! The dream is just a starting point of course. It can take several months to develop that spark into a full-blown plot. What is it about the fantasy genre--in particular, the YA genre--that appealed to you? Obviously, I grew up loving fantasy and YA. I loved Tamora Pierce’s books, along with Patricia C. Wrede, The Hobbit, and of course the Harry Potter books as an older teen. It was inevitable that I would end up writing a Young Adult fantasy, although as I stated before, my latest project is actually a contemporary young adult novel. Nowadays, I tend to like the heavier, darker YA novels, but I also read a ton of adult literary novels, as well as romance. I love to read all genres really, but I have a soft spot for YA that has never left me. There is something about that age, the hope, the wonder, and the fear, that really stuck with me. Is this a series? If so, can you give us a peek into what readers can find in future installments? That’s not entirely true… I have the next three books all plotted out, but things change so drastically when I am actually writing that it’s hard to know where I’m going to end up! Some readers believe there are too many love triangles in YA today. What are your thoughts, especially regarding Ellie's attraction to two men, Vance and Devin? Well, I will say that it’s not a love triangle in the traditional sense. I’m not sure that there is really any question about where Ellie’s true feelings lie. It’s more that there are issues and obstacles in her path to true love. Honestly, I never get tired of love triangles in other author’s books, so maybe that’s why I included a pseudo-love triangle in mine. Write what you love, right? Because even though you hope your readers will love what you have written, in the end, you’re really writing for yourself. What was your experience writing Morfan? Was your antagonist fun to create? To be honest, I’ve seen a lot of ugliness in life. It wasn’t such a leap to create Morfan. You just take the worst character traits you’ve seen and roll them all into one person. You have to make it believable, though. I don’t know if I’ll ever get into it in my novels, but Morfan (like all my characters) has a complete life story. Things happened to him to make him the way he is. He isn’t just bad to be bad; so many nasty things happened to him that eventually they warped who he was. I love the interview. Thanks for posting.